Last night's Love Island (July 2) delivered a brutal recoupling, which saw Georgia Steel dumped by Josh Denzel for new girl Kazimir Crossley. Viewers were heartbroken for Georgia, after they watched her stay loyal to Josh while he was away in Casa Amor with the new arrivals. 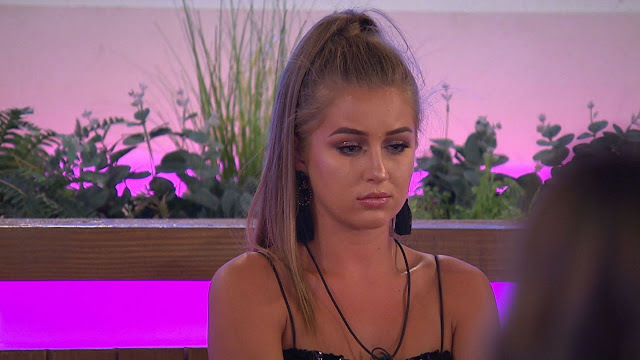 The recoupling ceremony was one of the most awkward in the series' history, as Georgia was left until last to be asked if she wanted to stay with Josh or pair up with someone new. Opting to stay with Josh, Georgia then had to watch him walk back into the villa hand in hand with Kaz, meaning Georgia was now single. But amidst all the drama, some viewers might have missed another awkward moment – as not even host Caroline Flack could hide her feelings towards Josh. Caroline asked Josh if he thought he'd made the right decision by picking Kaz, considering Georgia wanted to stay coupled up with him. Josh said he had gone with his gut and added: "I went into Casa Amor thinking that I wasn't going to get my head turned. If I did, it has to be someone sensational, someone who blew me away, and Kaz came and did that." Josh's straightforward answer caused Caroline to let out a shocked "okay" and turn away from him. The host then delivered a very unconvincing "congratulations", as Josh and Kaz took their seats. Caroline's reaction to Josh summed up what many fans who are firmly Team Georgia were thinking. They've officially had it with Josh.